Riva Del Garda, Italy – Stellar, absolutely classic Lake Garda conditions prevailed on opening day at the 2015 Audi-Tron Sailing Series hosted by Fraglia Della Vela Riva and organized by B.Plan Sport & Events (BPSE) in cooperation with Melges Europe. A big pumping breeze and pronounced swells made for premium sailing conditions with the flourishing Russian Audi Melges 20 fleet on full charge. 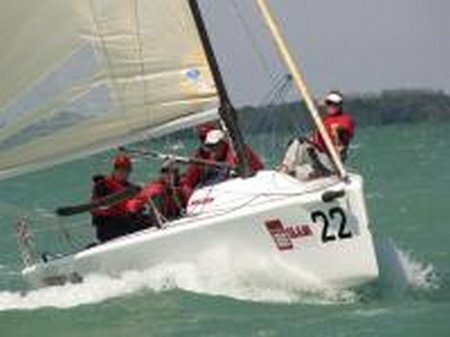 In particular, Igor Rytov on RUS-296 now leads the field of 40 teams after two races. The first warning of the day did not commence until around 3 o’clock in the afternoon with Yury Morozov on Russotrans stealing the show with a well-deserved bullet. Rytov gave it a good go under the beautiful 20+ knots of breeze to take second followed by Italy’s Dario Levi on Fremito D’Arja finishing up the heat in third. Levi was challenged on multiple occasions by Alessandro Rombelli’s STIG that came fourth and Vladimir Prosikhin on Nika was fifth. Race Two gave way to more surprising advances and finishes by Anatoly Karachinsky on Versya. Karachinsky was on fire in the big breeze leading the fleet around the buoys in first followed closely by Claudio Dutto’s Asante Sana. Dutto had a great finish for second. Marco Franchini’s Mezzaluna did well to come third, followed by a fantastic photo finish between Rytov and Kirill Podolsky on AnywayAnyday.com winning fourth and fifth respectively.